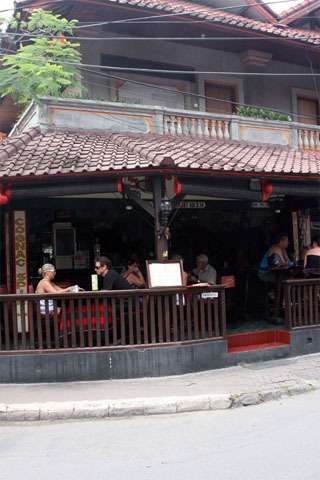 Given its popularity with tourists, Legian has a wide range of eateries catering to most tastes. It’s a tourist heavy scene and for finer dining we’d be angling for Seminyak. The food is absolutely delicious and for the price, it is an absolute bargain. Most people elect to eat nasi goreng, mie goreng or nasi campur which are inoffensive to Western palates — moreover, they are a taste revelation. 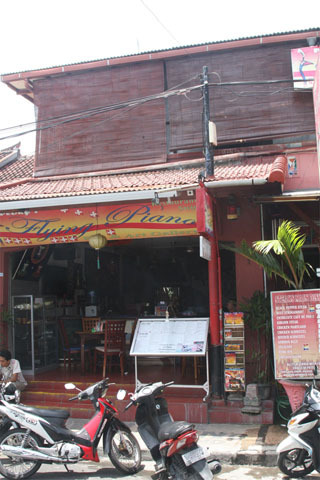 This may well be the best starting point for visitors to get into Indonesian food in comfortable... Read our full review of Warung Yogya. The Australian owner was trained by a world champion barista and uses a La Marzocco machine to extract perfect shots from fresh beans. The machine, technique and beans combine to make one of the finest coffees in Bali — one that would rival some of the better coffees in big cities in the West. Of course, this place is not all about the coffee and a range of burgers and pizzas is also on the... Read our full review of Swish Bar and Restaurant. This should be a backpacker favourite as the tasty meals are generous in size and prices are as close to local as is possible without it being overrun by locals – they’re in the back alleys getting a feed rather than sitting perched high above Jalan Werkudara taking in the atmosphere of bustling Legian. 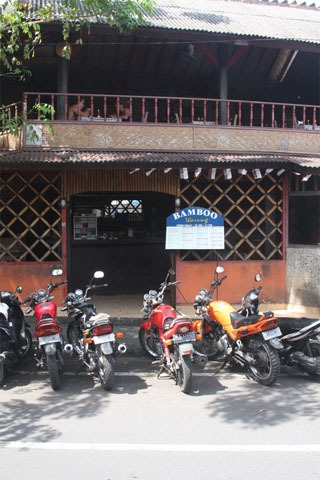 A nasi goreng will set you back just 10,000 rupiah here, but as you get more exotic, so do... Read our full review of Bamboo Warung. 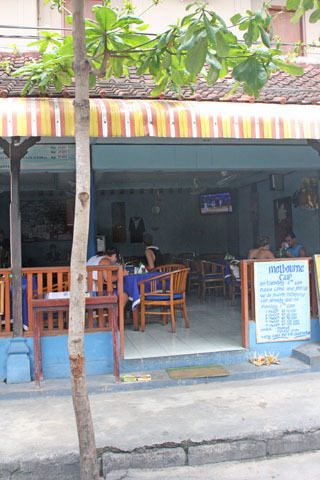 Things are a little more upmarket here than many other places in Legian with gourmet sandwiches and a more pleasant setting where beer is not the focus. The operators know what they’re doing and you won’t be disappointed if you choose to spend a little extra money for a meal of higher quality than the surrounding... Read our full review of Wayan and Friends. 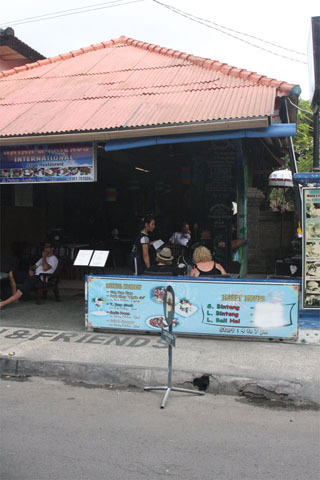 Not surprisingly given the cost of the booze, Bali Bagus is a very popular spot for a mid-afternoon refreshment and burger. It’s not a fancy place at all and for many that is half the attraction. 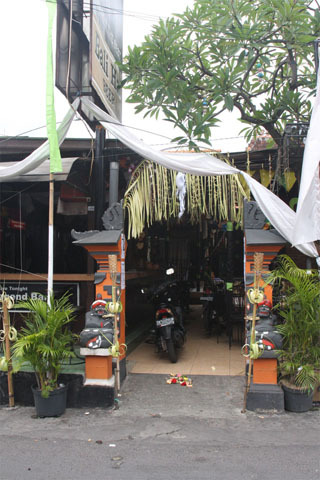 Friendly... Read our full review of Bali Bagus. The Legend gets packed, especially in high season and attracts a raucous, oft-Australian crowd. A buffet deal held at regular intervals costs 75,000 rupiah and includes as much quality food as you can eat. On special dates throughout the year, theme nights are... Read our full review of The Legend. It’s an odd place in that it looks like many of the other places around town, but charges about 20% more for beer while still retaining a decent crowd of loyal followers. 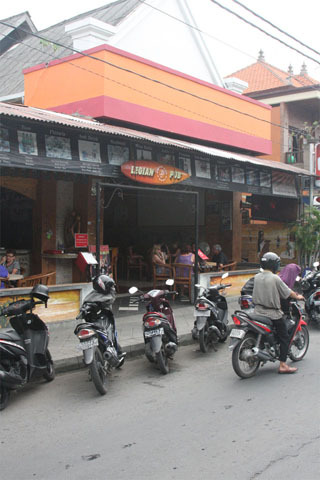 You’ll find the crowds starting to drink beer from about 11:00 and not dispersing until early the next... Read our full review of Legian Pub. The cosmopolitan menu consists of a mix of pizza, pasta and Swiss favourites and allows those from all corners of Europe to get a taste of back home. The claim is that they have the best fondue in Bali and who are we to argue?... Read our full review of Pedro's Flying Piano. 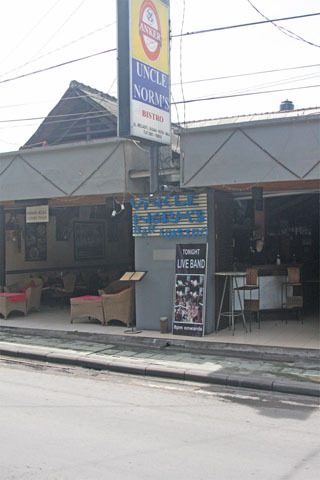 Uncle Norm’s charges a bit more for its beer and food, but has many of the same characteristics as the other places around this part of Legian -- normal tourist meals such as burgers and pasta and a rollicking night time vibe. Still, this is a good place to come and have a beer and catch up with some... Read our full review of Uncle Norm's. 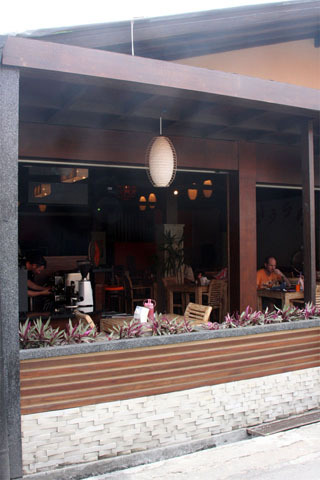 With its comfortable streetside seating in the heart of Legian, Posers makes for a good people watching spot to watch everything slide right by and it gets a huge amount of passing trade because of this. Extremely popular for a drink or pub-style meal even though the prices are a little higher than similar bars... Read our full review of Posers.